Also know as, “Pasta with Sardines.” This meal originates from Sicily. My Italian roots shine through on this one. This is a national dish of Sicily. 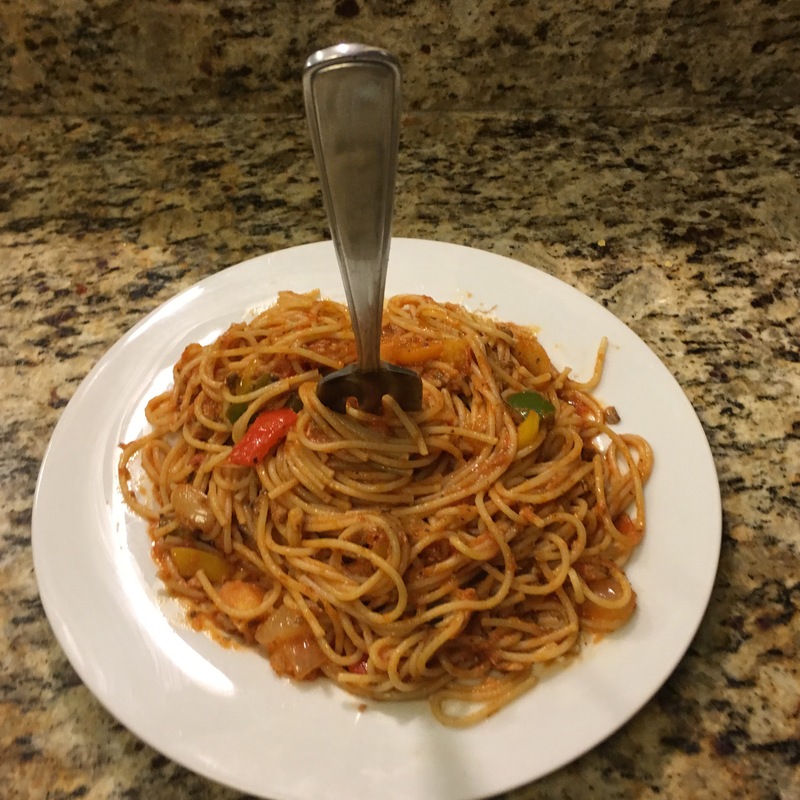 It’s either pasta with italian sauce only, pasta with italian sauce loaded with vegetables, or pasta with italian sauce, veggies, and sardines! At one point I would add boca crumbles but it doesn’t really do it for me anymore. This recipe to some doesn’t sound appealing because sardines are in the mix. If you read my post, Spicy Sardine & Potato Stew you can gain insight about the health benefits connected to eating Sardines. Not only are sardines good, but they are good for you. Here are the recipe details for this dish. Most people think of Anchovy when thinking of Sardines, but they are very different. Though they are both small saltwater fish with soft bones and Mediterranean origins, the sardine and the anchovy are not the same fish. Sardine is an imprecise term for any number of small, silvery saltwater fish related to the herring and found throughout the world. You can read more about the differences between these two by visiting CookThink.com. Heat oil in frying pan. Add garlic and ginger first. In another large pot, boil 6 cups of water for pasta. Add onions to oil. Cook for 5 minutes. Add peppers. Cook for 5 minutes. Add sardines. Season well. Then blend, breaking up sardines. Add pasta sauce. Season well. Then blend and allow to simmer on low heat. Add pasta to boiling water and allow to cook 8 minutes. When done, drain in collandar and rinse with cool water. Return to large pot. Add your sauce combined with sardines, peppers, and onions. Mix well ensuring sauce mix is evenly on noodles. Stick a fork in it and Enjoy! Previous Post Pep it up!